For the last 15 years, Sopot, the corrupt dictator, has oppressed the people of the Commonwealth. His relentless pursuit of unification with the neighboring United Republic has left the country soaked in unnecessary bloodshed and poverty. Propaganda is plastered throughout communities and a Public Information Building, built as a tribute to the self-centered chancellor, spews news broadcasts with claims of victory as more and more soldiers fall victim. Fed up after years on the front lines, a group of super-soldiers injected with nanotechnology vow to replace the dictator and restore peace. 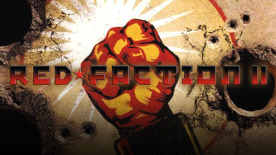 2002, 2003 THQ Inc. Red Faction®, Geo-Mod® Technology, THQ and their respective logos are trademarks and/or registered trademarks of THQ Inc. All rights reserved. All other trademarks, logos and copyrights are property of their respective owners.